ADOPTED! Taboo is a 3 yr old Am staff. 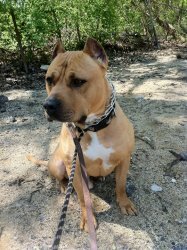 He was found as a stray dragging a 7 foot tow chain wrapped around his neck. 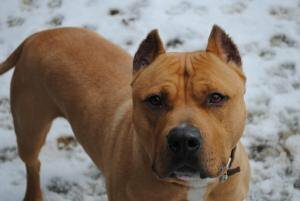 Taboo has a quiet demeanor, but gets really excited when the volunteers come to walk him, he enjoys being outside but loves even more curling up in his bed with a nice bone. He is currently going through obedience training. Taboo is up-to-date with routine shots, house trained, micro-chipped and neutered. If you are interested in finding out more information about Taboo, contact Bombshell Bullies at: 630-336-0458 or email them at: bombshellbullies@hotmail.com.